Background and objectives: Despite widespread use of tunneled hemodialysis (HD) catheters, their utility is limited by the development of thrombotic complications. To address this problem, this study investigated whether the thrombolytic agent tenecteplase can restore blood flow rates (BFRs) in dysfunctional HD catheters. Design, setting, participants, & measurements: In this randomized, double-blind study, patients with dysfunctional tunneled HD catheters, defined as a BFR <300 ml/min at −250 mmHg pressure in the arterial line, received 1-hour intracatheter dwell with tenecteplase (2 mg) or placebo. The primary endpoint was the percentage of patients with BFR ≥300 ml/min and an increase of ≥25 ml/min above baseline 30 minutes before and at the end of HD. Safety endpoints included the incidence of hemorrhagic, thrombotic, and infectious complications. 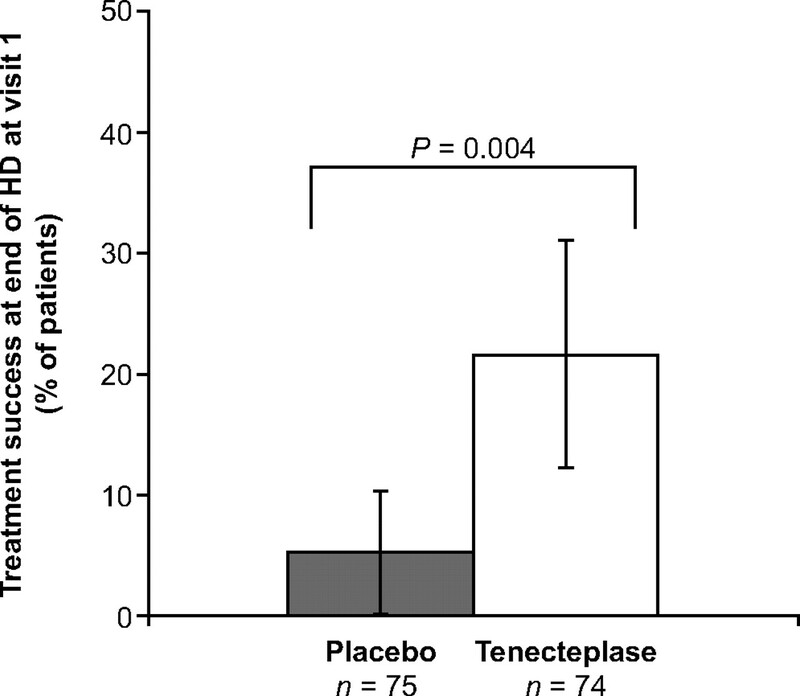 Results: Eligible patients (n = 149) were treated with tenecteplase (n = 74) or placebo (n = 75). Mean baseline BFR was similar for the tenecteplase and placebo groups at 151 and 137 ml/min, respectively. After a 1-hour dwell, 22% of patients in the tenecteplase group had functional catheters compared with 5% among placebo controls (P = 0.004). At the end of dialysis, mean change in BFR was 47 ml/min in the tenecteplase group versus 12 ml/min in the placebo group (P = 0.008). Four catheter-related bloodstream infections (one tenecteplase, three placebo) and one thrombosis (tenecteplase) were observed. There were no reports of intracranial hemorrhage, major bleeding, embolic events, or catheter-related complications. Conclusions: Tenecteplase improved HD catheter function and had a favorable safety profile compared with placebo. Effective hemodialysis (HD) requires reliable vascular access. Arteriovenous fistulas and grafts are preferred over catheters for their higher patency rates, prolonged survival, and lower complication rates (1–3). However, HD catheters are used by most dialysis patients to provide temporary access or to allow maturation of surgically placed fistulas (4). Tunneled catheters may also be used because of comorbidities or exhaustion of all graft and fistula sites (5,6). HD catheters must be carefully managed to mitigate a high complication rate. For example, catheter thrombosis is estimated to occur at a frequency of 0.5 to 3.0 events/1000 catheter-days (7–9). Among patients who experience access loss, catheter thrombosis is the precipitating event in 30% to 40% (1). Thrombotic obstruction of the catheter lumen reduces blood flow rate (BFR), frequently impeding the delivery of adequate HD. Treatment of partial occlusions of catheter lumens is often postponed by catheter line reversal, contributing to recirculation without addressing the underlying thrombus. The National Kidney Foundation's Kidney Disease Outcomes Quality Initiative guidelines for HD vascular access advise against regular use of line reversal to manage low BFR (1). Maintenance of catheter patency is critical because many patients rely on catheter access for HD, and catheter insertion sites are limited. Administration of a thrombolytic directly into a dysfunctional HD catheter lumen may provide a way to salvage catheters with suboptimal BFRs while minimizing the risk of adverse events (AEs) associated with systemic delivery of these agents and avoid the need for catheter replacement. Previous studies evaluating the efficacy of alteplase or reteplase for clearance of HD catheters have yielded conflicting results (10–25). Limitations of prior studies include differences in trial design, sample size, thrombolytic dose, and definitions of treatment success. Until now there have been no large-scale, randomized, double-blind controlled trials using well defined efficacy and safety endpoints. As a result, many questions remain regarding the efficacy and safety of thrombolytics in the treatment of dysfunctional HD catheters. Tenecteplase is a recombinant serine protease that binds to fibrin and converts thrombus-bound plasminogen to plasmin, thereby stimulating local fibrinolysis. Tenecteplase has three engineered amino acid changes, resulting in greater fibrin specificity and an increased resistance to plasminogen activator inhibitor-1 compared with alteplase (26,27). When injected systemically, tenecteplase has a plasma half-life of approximately 22 minutes (28) and is primarily cleared by the liver (29). However, when tenecteplase is administered intraluminally for HD catheter dysfunction and subsequently withdrawn, circulating tenecteplase levels are not expected to reach detectable concentrations (30). Tenecteplase maintained clot lysis ability for 72 hours in a catheter in in vitro studies (Genentech data on file). In this study, we compared the efficacy of tenecteplase with placebo in improving BFR in dysfunctional HD catheters. TROPICS 3 (Tenecteplase for the Restoration of Function in Dysfunctional HD Catheters 3) was a phase III multicenter, randomized, double-blind, placebo-controlled study. All patients provided informed consent before participation and the sites' institutional review boards approved the protocol before the study was initiated. The study is registered at http://www.clinicaltrials.gov (NCT00396032). 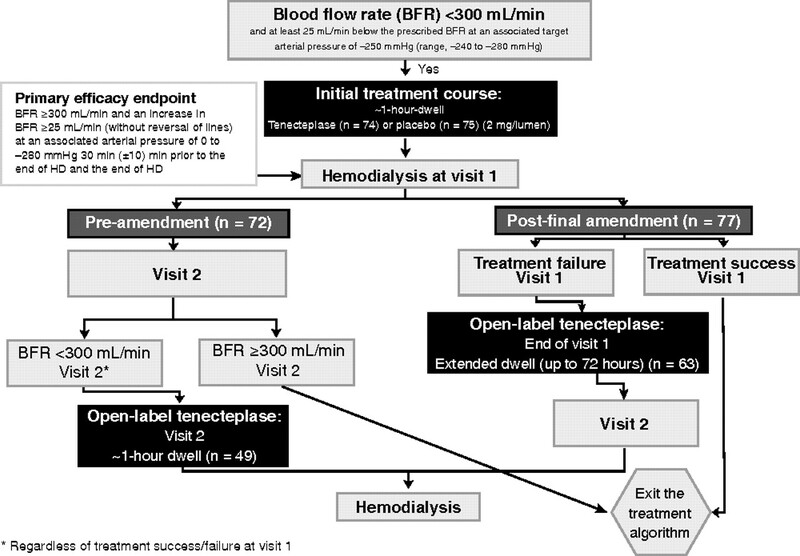 Eligible patients were ≥16 years of age and had cuffed, tunneled HD catheters with BFR <300 ml/min and ≥25 ml/min below the prescribed BFR, without reversal of lines, at an associated prepump arterial pressure target of −250 mmHg (range −240 to −280 mmHg) at baseline. Patients with arterial pressure outside of this range were eligible if there was catheter arterial limb collapse or an inability to aspirate blood from the arterial port. Participating patients were clinically stable in the opinion of the investigator and must have demonstrated a BFR ≥300 ml/min, without reversal of lines, during one or more HD sessions in the 14 days before study entry. Key exclusion criteria included known bacteremia or known or suspected infection in the HD catheter; evidence of mechanical, nonthrombotic cause of HD catheter dysfunction (assessment method at the physician's discretion) or dysfunction caused by a known fibrin sheath; any thrombolytic administration within 7 days; presence of an HD catheter internally coated with a therapeutic agent (e.g., Decathlon Gold catheter); use of heparin or other anticoagulant (except warfarin) within 24 hours (except for use during HD or for prophylaxis); if receiving warfarin, an international normalized ratio >3.0 within 7 days or target international normalized ratio >3.0; hemoglobin ≥12.0 g/dl with erythropoiesis-stimulating agent use if the dose had not been reduced or held; history of intracranial hemorrhage (ICH) within the previous 3 years, intracranial aneurysm, or arteriovenous malformation; increased risk for bleeding events or embolic complications or a known condition for which bleeding is a significant hazard; symptomatic hypotension resulting in BFR <300 ml/min; investigator-determined uncontrolled hypertension (e.g., systolic pressure >185 mmHg and diastolic pressure >110 mmHg); or known hypersensitivity to tenecteplase. The treatment schema is shown in Figure 1. Eligible patients were randomized within three strata (0 to 199, 200 to 274, and 275 to 299 ml/min) to minimize potential confounding effects of baseline BFR on treatment efficacy. Within each stratum, patients were randomized in a 1:1 ratio to receive tenecteplase or placebo using a hierarchical, dynamic algorithm implemented through an interactive voice response system. Tenecteplase (2 mg/2 ml) or placebo was instilled into each HD catheter lumen (4 mg total) for a 1-hour dwell after which study drug was withdrawn and HD was initiated. Two treatment regimens were studied. In the original protocol, patients with BFR <300 ml/min at the beginning of visit 2, regardless of treatment outcome at visit 1, were eligible to receive open-label tenecteplase (2 mg/2 ml) in each lumen of the HD catheter for a second 1-hour dwell. On the basis of investigators' reluctance to delay therapy until the next HD visit, the protocol was amended in March 2008, replacing the second 1-hour dwell with instillation of open-label tenecteplase at the end of visit 1 for an extended-dwell (ED) period (up to 72 hours) if treatment success was not achieved. ED tenecteplase was withdrawn before the initiation of HD at visit 2. The protocol amendment did not affect the assessment of the primary efficacy endpoint. Patients were followed for safety and maintenance of catheter patency for two HD sessions after final study drug exposure. An additional evaluation was conducted 30 to 36 days after visit 1 or upon early termination from the study solely to assess anti-tenecteplase antibody status. At visit 1, BFR was measured at the beginning of the HD session, 1 hour before the session end, 30 ± 10 minutes before the session end, and at the end of HD. If the patient received open-label tenecteplase, BFR was measured in the same way at visit 2. BFR was also measured within the first 30 minutes of HD at each of the two visits that followed final study drug exposure (i.e., through visit 3 for patients who received only the initial 1-hour dwell at visit 1 and visit 4 for patients who received open-label tenecteplase). The primary efficacy endpoint was the percentage of patients with treatment success, defined as BFR ≥300 ml/min and an increase of ≥25 ml/min from baseline BFR, without reversal of lines, at an associated target arterial pressure of 0 to −280 mmHg 30 ± 10 minutes before and at the end of HD, during visit 1. Secondary efficacy endpoints included (1) treatment success at visit 2 after receiving open-label tenecteplase (given as a 1-hour dwell or an ED); (2) mean change in BFR from baseline to the end of visit 1; (3) mean change in BFR from baseline to the end of visit 2 in patients who received ED open-label tenecteplase at the end of visit 1; and (4) the frequency with which catheter patency (within the first 30 minutes of an HD session) was maintained at visits 2 and 3 among patients who achieved treatment success at visit 1. The incidence of AEs, serious AEs (SAEs), and targeted AEs [ICH, major bleeding, embolic events, extremity thrombosis, catheter-related bloodstream infection (CRBSI), and catheter-related complications] were recorded from initial treatment through the final follow-up visit (two visits after final study drug exposure). AEs were summarized by MedDRA System organ class and preferred term. An independent data-monitoring committee reviewed cumulative safety data. A sample size of approximately 150 patients was determined to give >90% power to detect a tenecteplase treatment success rate of 25% against a placebo success rate of 5%, utilizing a two-sided χ2 test at the 0.05 level of significance. Analyses were based on the modified intent-to-treat population, which included all randomized patients who received at least one dose of assigned treatment of tenecteplase or placebo. Any patient who discontinued the study before completing HD was considered a treatment failure. Statistical analyses were performed using SAS version 9.1 (SAS Institute, Inc., Cary, NC). All statistical tests were conducted at the 0.05 level of significance. Treatment success proportions after a 1-hour tenecteplase or placebo dwell were analyzed using the Cochran-Mantel-Haenszel test. Mean change in BFR from baseline to the end of HD at visit 1 for each treatment group was compared using analysis of covariance with duration of catheter dysfunction and baseline BFR as covariates. Confidence intervals (CIs) were also calculated for the percentages of patients who maintained catheter patency at each visit. No interim analyses for efficacy were conducted. Patients (n = 149) were enrolled between January 2007 and November 2008. Enrolled and randomized patients received at least one dose of tenecteplase (n = 74) or placebo (n = 75) at 37 U.S. centers. One hundred forty-one (95%) patients completed the study (Figure 2). Selected demographic and baseline characteristics are presented in Table 1. Treatment success was significantly higher in tenecteplase-treated patients (22%; 95% CI 12% to 31%) compared with placebo-treated patients (5%; 95% CI 0.2% to 10%). The absolute difference (17%) between groups was statistically significant (95% CI 6% to 27%; P = 0.004; Figure 3). Mean change in BFR from baseline to end of HD was significantly greater in the tenecteplase than the placebo arm (47 ± 103 ml/min versus 12 ± 56 ml/min; P = 0.008). Percentage of patients demonstrating treatment success at the end of HD at visit 1 after placebo or tenecteplase. Bars represent 95% CIs. The percentage of patients achieving treatment success at visit 1 by baseline BFR category was also determined. In the largest of these subgroups (BFR 0 to 199 ml/min, n = 76), treatment success was demonstrated in 17% (6 of 36) of tenecteplase-treated and 3% (1 of 40) of placebo-treated patients. In the 200- to 274-ml/min BFR stratum, treatment success was observed in 29% (8 of 28) and 4% (1 of 25) of tenecteplase- and placebo-treated patients, respectively. In the 275- to 299-ml/min BFR stratum, 2 of 10 (20%) patients in each group had treatment success. Twenty-five of 63 patients (40%; 95% CI 28% to 52%) who received an initial 1-hour dwell of tenecteplase or placebo and then received ED tenecteplase for up to 72 hours at the end of visit 1 achieved treatment success. The mean (SD) BFR of the ED tenecteplase group changed from baseline by 105 (138) ml/min at the end of the next HD session. For the 49 patients with BFR <300 ml/min at the second visit who received 1-hour-dwell, open-label tenecteplase, the mean BFR (SD) change from baseline was 59 (130) ml/min by the end of the second visit; 11 of these patients (22%; 95% CI 11% to 34%) achieved treatment success. Among tenecteplase-treated patients who achieved treatment success at the initial HD visit and had subsequent catheter assessments, 8 of 16 (50%; 95% CI 26% to 75%) maintained catheter function at the next HD visit, and 10 of 13 (76.9%; 95% CI 54.0% to 99.8%) did so at the third visit. Among the patients who had treatment success at visit 2 and had assessment of catheter function at visit 3, 22 of 25 patients (88%; 95% CI 75% to 100%) who were in the ED group at visit 1 maintained catheter function at visit 3, as did 6 of 10 patients (60%; 95% CI 30% to 90%) who received 1-hour-dwell, open-label tenecteplase at visit 2. Patients with a short duration of catheter dysfunction (≤1 day) responded particularly well to tenecteplase treatment. Although 22% of all tenecteplase-treated patients achieved treatment success, the success rate among tenecteplase-treated patients with catheter dysfunction of ≤1 day (n = 40) was 35%. In contrast, only 8% of placebo-treated patients in this subgroup had treatment success (n = 40). Five patients (3%) developed targeted AEs from initial treatment through two visits after final study drug exposure. CRBSIs occurred in four patients, three among the 75 (4%) placebo-treated patients (before open-label tenecteplase exposure), and one among the 74 (1%) tenecteplase-treated patients. One patient randomized to the placebo group (n = 75; 1%) was diagnosed with a catheter-related deep vein thrombosis after treatment with open-label, 1-hour-dwell tenecteplase. There were no reports of ICH, major bleeding, embolic events, or catheter-related complications. Overall, 47 treatment-emergent AEs occurred in 28 patients (19%) through the completion of HD visit 3 or 4; the most common were nausea (n = 4; 3%), vomiting (n = 3; 2%), thrombosis in the dialysis circuit (n = 3; 2%), upper abdominal pain (n = 2; 1%), chills (n = 2; 1%), pyrexia (n = 2; 1%), bacteremia (n = 2; 1%), and headache (n = 2; 1%). The only treatment-emergent AE considered by an investigator to be related to tenecteplase was one event of nonserious gingival bleeding. Six SAEs were reported in six patients (4%). Two SAEs occurred in patients who only received placebo (one bacteremia, one pneumonia). Four patients who received tenecteplase experienced one event each of sepsis (after 1-hour and ED tenecteplase), Clostridium difficile colitis (after placebo and ED tenecteplase), hypoglycemia, and convulsion (the latter two after placebo and 1-hour tenecteplase). None were judged by the investigator to be related to the study drug. One patient had a negative antibody titer at baseline and tested positive for anti-tenecteplase antibodies at follow-up (1%); this patient did not experience an AE during the study. Approximately one-fifth of prevalent HD patients in the United States were dependent on catheters for vascular access in 2005 (4). According to data from the 2007 ESRD Performance Measures Report, during a 3-month period, 19% of adults required catheter placement because of exhaustion of all fistula or graft sites (6). In these patients, HD catheters are a lifeline, and long-term maintenance of patency is central to delivery of this life-sustaining therapy. 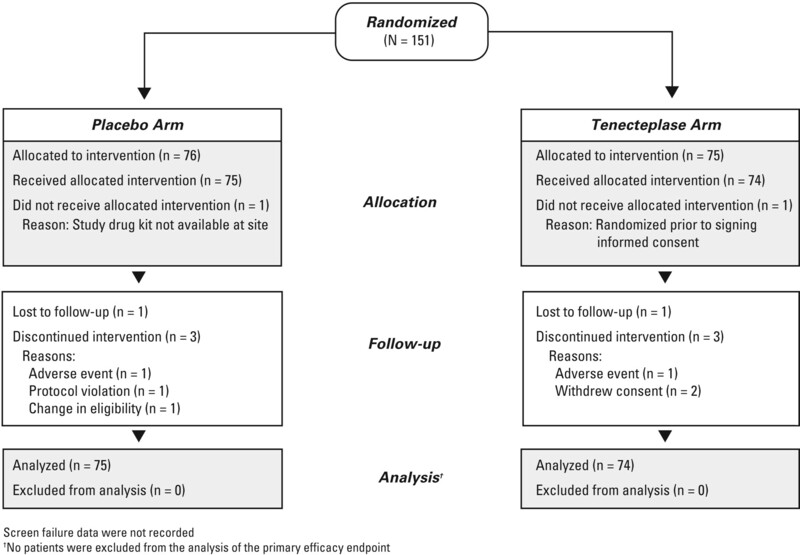 In this randomized, controlled clinical trial comparing tenecteplase with placebo for the treatment of dysfunctional HD catheters, tenecteplase administered as a 1-hour dwell resulted in significantly higher treatment success rates in patients with dysfunctional HD catheters than did placebo (22% versus 5%, respectively; P = 0.004). Furthermore, tenecteplase produced a significantly greater change in mean BFR after a 1-hour dwell (47 versus 12 ml/min with placebo; P = 0.008). Among patients who underwent a treatment regimen of 1-hour tenecteplase or placebo followed by ED tenecteplase, 40% achieved treatment success at the next visit. Importantly, treatment success was sustained through the subsequent treatment for more than 80% of patients who achieved treatment success after open-label ED tenecteplase. Clinically meaningful improvements in BFR for some patients did not meet the multiple stringent criteria for treatment success required in this clinical trial, but overall treatment success increased with a repeat instillation of tenecteplase. Notably, tenecteplase given as an ED treatment increased BFR in many patients who did not achieve success with the initial 1-hour dwell and was associated with a large change in mean BFR over baseline. These data suggest that a regimen of 1-hour-dwell followed by ED tenecteplase may enhance clinical benefit in some patients. However, these findings reinforce the need to properly assess catheters for other causes of dysfunction or patient characteristics that may limit or prohibit response to treatment with thrombolytics. Use of tenecteplase for dysfunctional HD catheters with poor BFRs was associated with a low incidence of AEs. In this study, few targeted AEs were reported (n = 5; 3%), and they occurred primarily in placebo-treated patients. SAEs were also infrequent (n = 6; 4%) and unrelated to tenecteplase. Four study patients (3%) developed CRBSIs; only one of these events occurred after tenecteplase exposure. The incidence of CRBSIs in tunneled, cuffed HD catheters has been reported as 1.6 to 5.5 episodes/1000 catheter-days (31). The favorable safety profile observed is perhaps not surprising given that tenecteplase is delivered locally as an intracatheter instillation rather than administered systemically. Earlier studies with other thrombolytic agents have evaluated a range of efficacy endpoints and reported varying outcomes. In many of these studies, a BFR of 200 or 250 ml/min was used as the threshold for treatment success; in others, efficacy was based on completion of HD sessions or on median catheter survival times (10–14,16,19,21,25,32). Because of these inconsistencies, direct comparisons between published studies and the results of this large, randomized, placebo-controlled trial cannot be made. In contrast to previous studies, TROPICS 3 was designed with precisely defined efficacy and safety endpoints; to be considered a treatment success in this study, patients had to attain a BFR of ≥300 ml/min and an absolute improvement in BFR of ≥25 ml/min over baseline, without line reversal, at 30 minutes before the end of HD and at the termination of HD. Thus, only patients with robust and sustained improvements in BFR qualified as achieving treatment success. There are several limitations to this study. The short follow-up period precluded evaluation of long-term outcomes. The effect of tenecteplase on catheters that were dysfunctional because of fibrin sheaths was not studied. Finally, only adult patients were enrolled, so the efficacy and safety in pediatric patients are unknown. Although the Kidney Disease Outcomes Quality Initiative guidelines recommend thrombolytics as first-line therapy for dysfunctional catheters (1), the efficacy and safety of thrombolytics have not previously been evaluated in a phase III, double-blind, placebo-controlled trial. Here, we demonstrate that tenecteplase (2 mg/2 ml per lumen) administered as a 1-hour dwell improved HD catheter function, as measured by BFR, relative to placebo. Furthermore, treatment success was increased by following the initial 1-hour dose of placebo or tenecteplase with a second 1-hour or ED open-label tenecteplase treatment. These data provide the strongest evidence to date that tenecteplase safely improves HD catheter function. J.T. has received research support from Genentech; J.G. has nothing to declare; D.S. has received research support from Genentech; D.R. has nothing to declare; K.A.N. is a consultant for Genentech; M.B. is an employee of Genentech and has stock ownership interest in Roche; J.J. is an employee of Genentech and has stock ownership interest in Roche; B.G. is employed by Quintiles, Inc., the research organization that was contracted by Genentech to execute the TROPICS trials; and S.B. is an employee of Genentech and has stock ownership interest in Roche. This study was sponsored by Genentech, Inc. Support for third-party medical writing assistance was provided by Genentech, Inc.